The 2015 Hyundai Santa Fe is Hyundai's large 3-row family crossover. Its predecessor was the long-lived Veracruz, which was a nice enough rig but lacked Hyundai's defining fluidic-sculpture design language. The Santa Fe solves that problem with its thoroughly modern styling, and like most Hyundai models, it's value-packed for the price. Plus, its 3.3-liter V6 offers a solid mix of performance and fuel economy. Notably, while the 2015 Santa Fe's name evokes 2-row Santa Fe models from the past, Hyundai has changed things for its current-generation crossovers. 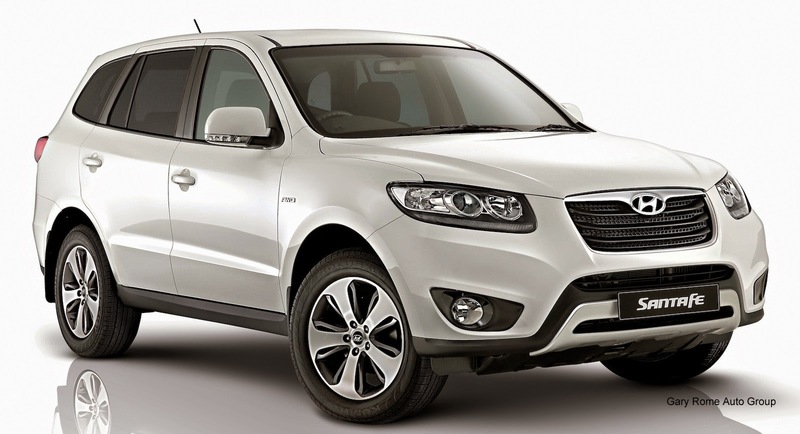 The 2-row Santa Fe is now known as the Santa Fe Sport, which is reviewed separately. Take the Sport part away and you have the 3-row Santa Fe, which is also distinguished by that standard V6 (the Sport only comes with a 4-cylinder). Underneath, however, the Santa Fe siblings are closely related, so it comes down to whether you want a third-row seat and the extra room that comes with it. Overall, the 2015 Santa Fe is a fully competitive 3-row crossover, and those distinctive looks should enhance its appeal for many shoppers. It's a must-drive in this segment. The 2015 Santa Fe gets a revised adjustable-effort steering system and standard daytime running lights. It also adds an available hands-free power liftgate. All Santa Fe models come with a 6-speed automatic transmission and either front- or all-wheel drive. The engine is a 3.3-liter V6 rated at 290 horsepower and 252 lb-ft of torque. Fuel economy, according to the Environmental Protection Agency, is 18 miles per gallon in the city and 25 mpg on the highway with front-wheel drive, or 18 mpg city/24 mpg hwy with all-wheel drive. The 3-row Santa Fe is offered in two trim levels: GLS or Limited. The GLS ($31,045) starts with 7-passenger seating (including a sliding and reclining second-row bench seat), 18-inch alloy wheels, fog lights, a leather-wrapped tilt-telescopic steering wheel, a 12-way power driver seat, heated front seats, a rearview camera, Hyundai's Blue Link telematics and a 6-speaker audio system with a 4.3-in touchscreen and USB/Bluetooth connectivity. The Limited ($35,145) features 6-passenger seating (including second-row captain's chairs), keyless entry/start, a hands-free power liftgate, a blind spot warning system, dual-zone automatic climate control, a 4-way power passenger seat, leather upholstery, rear window sunshades and an auto-dimming rearview mirror with HomeLink. Exclusively available on the Limited is an Infinity surround-sound audio system with 12 speakers and 550 watts of output, while the base GLS can be outfitted with a 10-speaker Dimension audio system. Also, the GLS can optionally be equipped with many of the Limited's standard features. Other notable options, depending on trim and grouped into packages, include xenon headlights, LED taillights, a panoramic sunroof, a navigation system with an 8-in touchscreen, ventilated front seats and heated second-row seats. 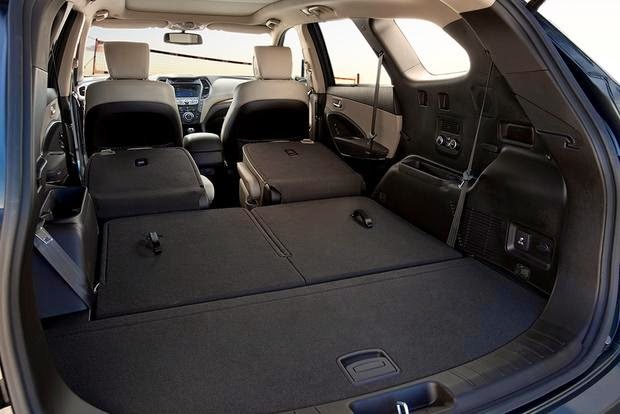 In terms of cargo space, the 3-row Santa Fe provides a minimal 13.5 cu ft. behind the third row, expanding to 40.9 cu ft. with the third row folded and 80 cu ft. with both rear rows folded. That's a handy amount, to be sure, but some rivals (the Mazda CX-9, for example) offer much more. The Santa Fe can tow a healthy 5,000-pound load if you're so inclined. The 2015 Hyundai Santa Fe comes with standard stability control, 4-wheel anti-lock disc brakes and seven airbags (front, front-side, driver-knee and full-length side-curtain). A blind spot warning system is standard on the Limited and optional on the GLS. The independent Insurance Institute for Highway Safety (IIHS) awarded the Santa Fe its top rating of Good in all crash-test categories. The Santa Fe's front seats are nice and high, giving you a commanding view of the road. Materials quality is impressive, with soft-touch materials applied generously across the dashboard and door panels. The standard 4.3-in touchscreen is a welcome high-tech touch, but the optional navigation system's 8-in touchscreen is superior in both functionality and style. 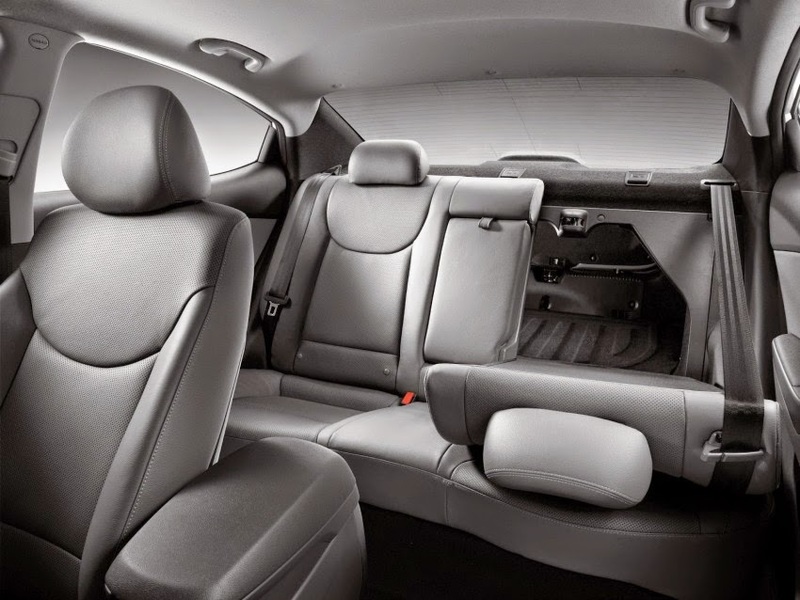 The standard second-row bench seat in the Santa Fe offers good legroom, and we like how it slides and reclines to enhance both second- and third-row comfort. Speaking of the third row, it's not the most spacious you'll find, but it's big enough to be useful, especially for kids. Although the Limited's second-row captain's chairs lend an upscale feel to the rear compartment, we wish the bench seat were optional here, as some buyers may want a top-of-the-line Santa Fe with full 7-passenger capacity. Under the hood, the 3.3-liter V6 is always at the ready with smooth, muscular acceleration. This engine punches well above its relatively modest displacement, and its refinement at higher revolutions per minute is a plus, as well. The transmission is similarly capable, delivering the seamless upshifts and prompt downshifts that buyers at this price should expect. On the road, the Santa Fe is mostly a pleasant partner. Road and wind noise are muted, and the steering is more responsive than what you'll find in some competing crossovers. The 3-row Santa Fe rides firmly and can get a bit harsh on rough roads, but overall, it's a confident, composed cruiser. The Hyundai Elantra would continue to attract discerning car buyers, predominantly those looking for a refreshingly functional sedan with unbeatable combination of power, fuel economy, interior room features and affordability, according to the auto maker. Hyundai Motors Nigeria Limited, local custodian of Hyundai vehicles and a subsidiary of the Stallion Group said the Elantra has demonstrated unassailable qualities which have made the car the toast of trendy customers. The Elantra is available in two trims of 1.6litre A/T (automatic transmission) Executive sedan with fabric seat; 1.8litre A/T Elegance with fabric seat and 1.8litre A/T Elite with leather seat - all fitted with 16 inch alloy rims as standard. A cautious look at the Elantra would reveal lot of relevant updates that bring about some noticeable improvements to an affordable compact sedan that was already worth your consideration. For instance, there’s a new and more refined engine with a sport-tuned suspension that gives the car a level of driver engagement comparable to rivals. Hyundai has also succeeded in minimising road and engine noise that previously made its way into the cabin with the aid of apposite sound insulation to deliver a quieter ride. This salient feature could cause competitions such as Toyota Corolla, Honda Civic and Ford Focus to lose sleep. True to their words, the drive quality is commendable even though the engine, by design, has a balance mechanism to forestall undue rev which in turn, programmes the transmission to help maximise fuel efficiency instead of being spendthrift. A six-speed manual transmission is however standard but the six-speed automatic transmission earns praise for its responsive shifts, making good use of the engine’s power and delivering an EPA-estimated 28/38 mpg city/highway, which is good for the class. The Elantra is nevertheless quiet and comfortable enough for commuting coupled with well-bolstered front seats and ample rear legroom and generous trunk space thus allowing the folding rear seats in the sedan quite convenient when hauling bigger items. These distinctive features could as it were outclass arch rivals with other qualities like Hyundai’s latest infotainment features inside the cabin, including new display screen, generous equipment list, a comfortable ride, an accommodating trunk, and sharp styling - all at a reasonable price. Other standard features are new headlamps, fog lights, and LED taillights that lend a generally richer impression to the swoopy exterior. And inside, the feature-laden theme carries forward with power-adjustable front seats, leather or fabric trims, a tilting-and-telescoping steering column and a dashboard screen which presents a warning about distraction every time you start the car, thereafter it offers one of the easiest phone-linking systems in the biz. What’s more, a technology package adds unfathomable Hyundai security, keyless entry with immobiliser, larger display screen, a premium audio system and push-button start with easy-to-locate dashboard controls which cut down on driver distraction. This trim level also add fog-lights, LED accent and taillights with integrated turn signal repeaters on the mirrors; an automatic transmission, leather upholstery (Elite model only) and a six-way power driver seat (with power lumbar). 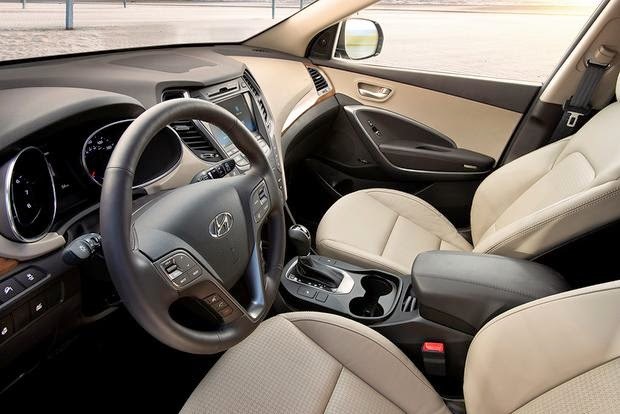 Technically, the Hyundai Elantra’s interior is roomy enough to be classified as a midsize sedan while the cabin is comfortable with some soft-touch materials and some rather hard plastics on the doors and switches. Coupled with this is a six-speaker audio system, a USB port and satellite radio with audio system and a 4.3-inch display and Bluetooth phone and audio connectivity with voice controls. You will be amazed the headroom up front is plentiful for six-footers and the steering wheel is a bit smaller in diameter than usual, which enhances the sense of space in the first row while the backseat is fine for kids and even tall adults. The new Hyundai Elantra is powered by either a 1.6litre or 1.8litre 4-cylinder engine that makes 145 horsepower and 130 lb-ft of torque. 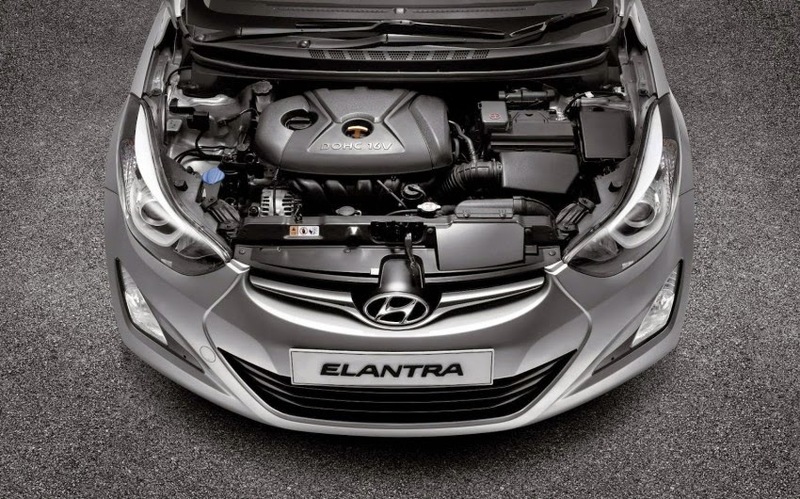 This engine gives the Elantra average acceleration and decent passing power. Transmission choices are a good-feeling six-speed manual or a very smooth six-speed automatic that is eager to shift and feels well-matched to the engine. The Automatic-transmission come with Hyundai’s manual-shifting mode, called Shiftronic, which lets drivers toggle through the gears if desired. Standard safety features for all Hyundai Elantra sedans include four-wheel antilock disc brakes, hill-start assist, stability and traction control, with driver and passenger airbags. The Blue Link emergency telematics system provides services such as remote access, emergency assistance, theft recovery and geo-fencing (allowing parents to set limits for teenage drivers). Government crash testing in the United States says the Elantra received an overall five-out-of-five-star rating, with four stars for total frontal crash safety and five stars for total side-impact protection. However, at the Insurance Institute for Highway Safety, the Elantra earned a second-best “Acceptable” rating in the small-overlap front-overlap crash test and top “Good” rating in the moderate-overlap frontal-offset, side-impact and roof strength tests. Its seat/head restraint design also rates “Good” for whiplash protection in rear impacts. With quality ratings and resale values good enough to rival the best competitors, the Elantra is a real threat to compacts like the Toyota Corolla, Honda Civic and Ford Focus. WESTFIELD, Mass. (WGGB) — 500 garages from 36 states have signed a lawsuit against top insurance companies. Cloot’s in Westfield is one of those auto body shop’s that’s speaking out. “Aftermarket…Aftermarket…Used…,” said Gary Cloutier from Cloot’s Auto Body. Gary says this has been an issue for years. Auto insurers pushing cheap and dangerous repairs on shops. “We’re being forced to use inferior parts which in turn is causing inferior repairs. Putting our customers vehicles in poor condition,” said Cloutier. The aftermarket parts can pose serious safety issues. He showed us pictures of parts that auto insurers told him to put on. They don’t fit. “When you take 10, 15, 18 parts collectively. Basically, the whole front of the vehicle. You try to put all that together. Now, you got the front of the nose on the vehicle that nothing matches off right,” said Cloutier. He says insurance companies are making him use similar components rather than the actual one. “Most if not all have preferred repair programs in place with local reputable auto body shops to protect the consumer from these types of practices. The insurance companies based here in ma can’t risk their reputations on delivering inferior repair parts to consumers,” said Stephen M. Brochu from AAA Pioneer Valley. Calls out to other insurance companies in the area weren’t immediately returned. Gary hopes the lawsuit will make sure insurance companies won’t have as much control over the repair process as they do now. 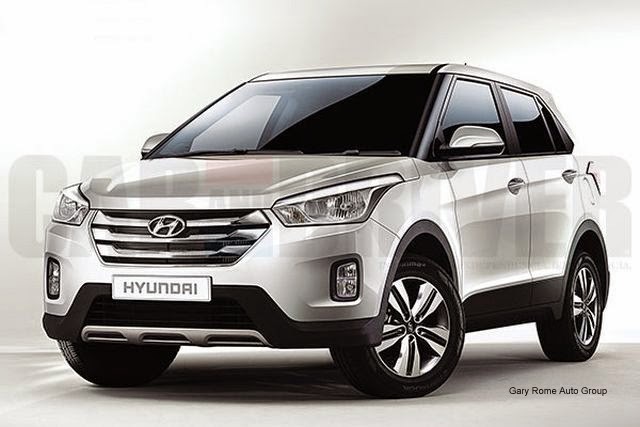 Auto major Hyundai Motor India is planning to put greater thrust on SUV segment with the launch of two products in this category this year. "The next focus will be on sports utility vehicles. Two SUVs are lined up that will be modern with premium feel," Senior VP and head of sales, Rakesh Srivastava, said here today on the sidelines of the launch of all-new 4S Fluidic Verna. Without elaborating on details, he said that both could be into the compact utility vehicle segment. SUVs account for 21 per cent of the industry with 2.5 million units and the numbers are growing, Srivastava said. Hyundai was aiming double-digit growth in 2015 against single-digit volume expansion forecast for the overall passenger car segment during the year. "With robust product lineup, we are targeting double-digit growth in 2015 along with increase in our marketshare by 1 per cent. In 2014 the company's marketshare was 16.3 per cent," Srivastava said. "Now, after surpassing four lakh units in domestic sales, we are looking at five lakh number shortly despite the biggest challenge before the industry is on growth," he said. In 2014, the passenger auto industry expanded by 3.2 per cent, with excise benefit over the year before. According to reports, the company was targeting four new models within one year to boost sales. Srivastava said, the company did not wait for Budget or policy guidance before product launch, which was done purely on internal strategy. However, the company doesn't have any immediate plan to increase manufacturing capacity. 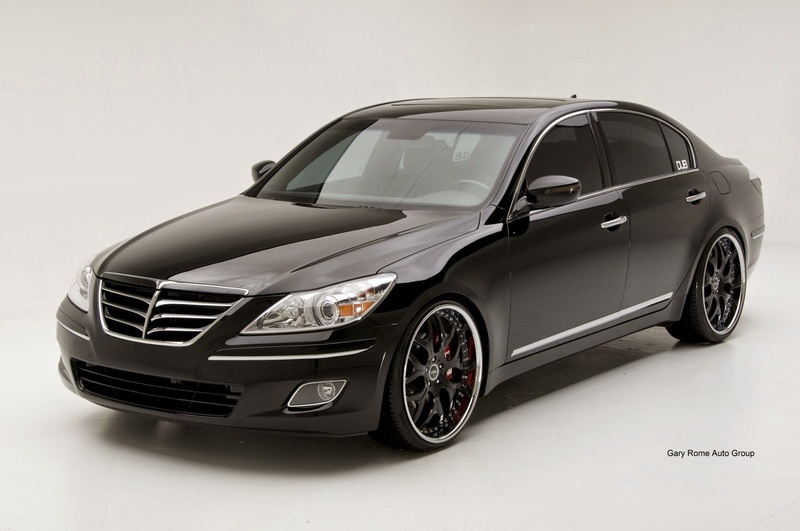 Who will be attracted to Hyundai's just-released premium sedan, the Genesis? Hyundai recently put this question to a selection of the nation's legal professionals, when it presented the new machine at the annual Devil's Own golf tournament, a legal get-together the brand sponsors. The verdict? Quite a few looked and many were impressed. None, however, showed immediate inclination to renounce their current Audi, BMW, Mercedes, Jaguar and Lexus model choices. Hyundai is heading to a niche spot with this new machine, for these days a prestige car is more likely to be an elite sports utility than a conventional saloon: Last year, just 680 sedans priced over $70,000 found homes (a tally almost exceeded by 2014's BMW X5 sales count alone). Most were bought by city-dwelling men, aged 50-plus. So it's a small circle. Yet Sinclair maintains he will find five to eight homes a month for the Genesis, which, if achieved, will be sufficient to outsell Jaguar's XF here. Can you see it? Actually, after a first drive, I kind of can; though not a landmark in the way the original Lexus LS was back in 1990, the new Genesis is still an enticing car. You can quibble over some aspects - for me the dynamics are a little soft and the styling similarities with some other offers (plus the Aston Martin-ish signature badge) will see it tagged ''the Generic'' - yet it's hugely impressive, nonetheless. Does the lack of pedigree matter? No more than it did when Lexus was fresh, and look at Toyota's toff division now. After time behind the wheel, it is certainly easy to appreciate the quality and, obviously, the value. Impressive refinement and a full luxury feel are backed by quality equipment and finish and a smart Ancap safety score. Standout on-road characteristics are the ride quality and the quietness; drivetrain, wind and road noise, even on coarse chip, are remarkably hushed; the eight-speed automatic slurs through its movements in particularly fine style. That eight-speed automatic is an impressive in-house effort and the engine is silky and quite reactive (0-100kmh in 6.5sec), though thirst and relative lack of sophistication (no self-activating stop/start technology) are less compelling. But the vehicle's dynamics are a mixed bag. Steering feel isn't overly obvious but it is accurate. The 19-inch Dunlops offer excellent grip, but the Genesis is heavy at two tonnes, and the level of body movement when hustled shows it is no sports sedan. The customer support package is light: the warranty is the same three-year cover as for any Hyundai and there is none of the usual luxury car talk of free tyres, service folk at any hour or tickets to the opera. But maybe that is reflected in the price. Aside from the fastback shape only slightly restricting headroom in the rear, it is generously roomy. Beyond a few ergonomic niggles, there's a palpable feel of premium luxury and it is comprehensively equipped. Hyundai is still in the button age, so no i-Drive central controller, but the key is a fancy card that detects when you're near the car and prepares accordingly. There is little that is truly new - though a CO2 sensor (this detects when carbon dioxide levels rise in the cabin and reduces them to avoid drowsiness) and the autonomous emergency braking that allows the car to self-brake to a complete stop from less than 80kmh are rare - but very little is left out. Hyundai is well-regarded here in brand studies but this exercise asks for uber-allegiance. Perhaps that's why there is just one H logo on the entire car, and it's on the boot. 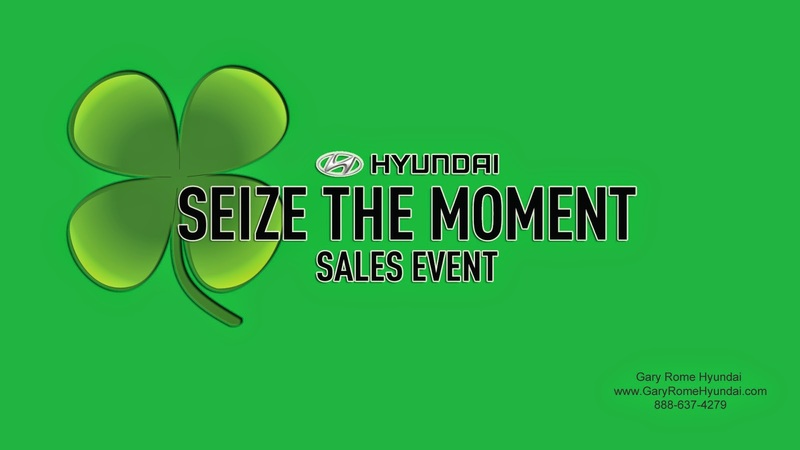 Two days before I was scheduled to pick up the Santa Fe, I receive a phone call from Hyundai informing me that, as it turns out, the Santa Fe is out of stock for the time being, and asking if I would mind reviewing the 2015 Sonata instead. So Saturday morning I catch a ride down to the Hyundai showroom with my younger sister to pick up the dreaded Sonata, and once I arrive a helpful young man hands me a pair of key fobs and shows me to the parking lot where the car is parked. “There it is,” he says. Now keep in mind that at this point I still haven’t bothered to check what the Sonata looks like, so I’m looking around trying to find a car that resembles a bland design I vaguely remember from 20 years ago. Except there are no bland cars in the lot; everything looks shiny and slick. And just as I’m about to give up and use the remote to find the car, the mirrors on this gleaming and really smart-looking sedan I am standing right next to swing out all on their own, and all my concerns about the Sonata evaporate. I take a step back to observe the car, and immediately my eyes are drawn to the panoramic sunroof. Nice! As I look more carefully, I realize the Sonata takes many of its design cues from the fabulous Genesis I’ve already reviewed. It features the same tight shoulder lines, the same graceful fastback roofline, a similar grille design and even a contemporary nose treatment that resembles that of the larger luxury sedan. And then you have the headlamps. In my opinion, there are two elements that are critical in showing off a beautiful car design, and the first of those is the lighting. 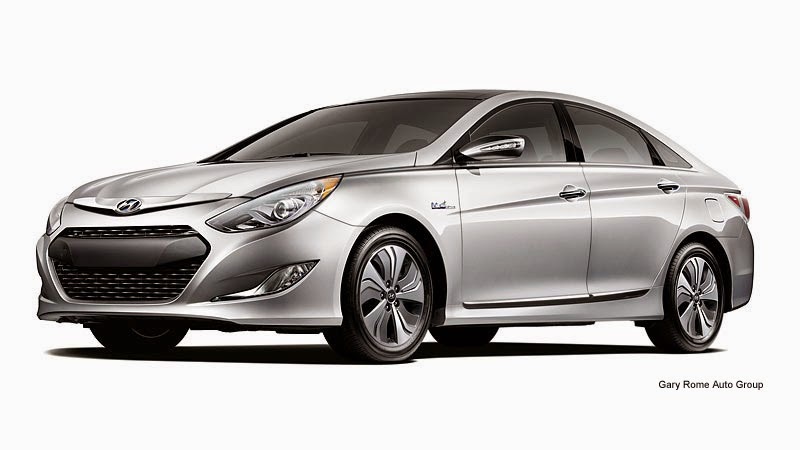 The Luxury Sonata boasts a pair of compound headlights with distinctly striking LED accents that really make the car stand out, and combination LED taillights that are just as arresting and distinctly Hyundai. The other element I mentioned is the wheel design, and the set of 18-inch rims fitted on the Luxury Sonata, boasting a flower pattern that looks both elegant and aggressive at the same time, is nothing short of a masterpiece. Finally, my eyes fall on the pair of sporty quadrilateral exhaust tips emerging from beneath the rear bumper, and I start having doubts about whether this is, in fact, the car I am supposed to test drive. The Sonata’s base price starts at $28,000 and goes up to $42,000 for the Luxury model. How can this much careful detail be injected into what is supposed to be a relatively inexpensive automobile? I guess they skimped on other features to keep costs down. To confirm my suspicions, I open the door, which conveniently features keyless entry and immediately also pokes a hole in my theory. I sit behind the wheel and take a look around. Oh boy, more holes in my theory – there’s no skimping on this car. 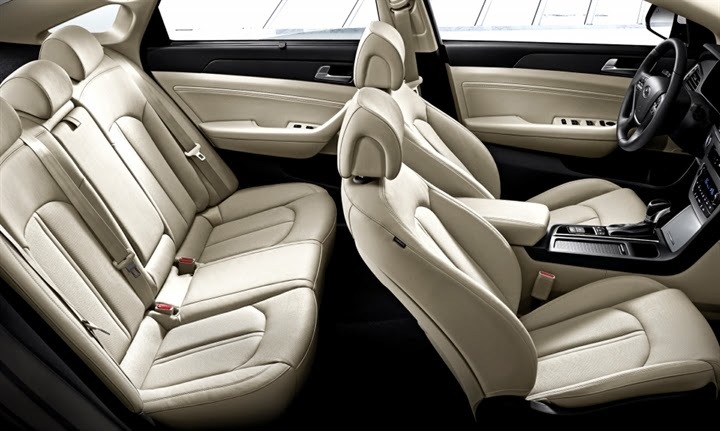 The power-adjusted leather seats, heated and ventilated, are remarkably comfortable, with plenty of space for even tall adults. Wood grain trim nicely adorns the dash and door panels, lending the interior a warm feel. 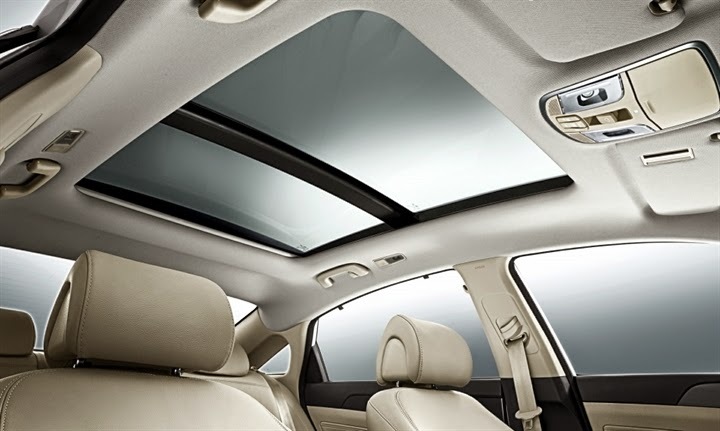 A fully retracting power sunshield lines the panoramic sunroof, while an electric curtain serves the same function for the rear window. The leather-wrapped steering wheel feels sublime, and features back-lit buttons for most essential features, including audio and cruise control. The car comes with parking sensors, an electric parking brake, a blind-spot detection system, self-dimming mirrors, Bluetooth connectivity, dual-zone climate control, navigation, USB and auxiliary input ports and a superb sound system, most of which can be controlled via a massive 8-inch touchscreen interface housed in the center stack. Put the car in reverse, and that screen also doubles as a display for the backup camera. In addition, you get a smaller helper screen placed between the speedometer and odometer gauges which displays all essential driver data. Once I start the car with the Start/Stop button, the quietness makes me even more intrigued; there’s no engine sound. So I put on my seatbelt and hit the road. The Sonata offers three different driving modes – Normal, Sport and Eco – and the six-speed automatic transmission comes with a tiptronic manual-shifting feature. Two minutes into the drive I’m already impressed because the gear changes are remarkably fluid and I don’t feel the shifts. Since I don’t really hear the engine, I wouldn’t know it’s shifting unless I look at the revs. How can they do so much on this car for that price? 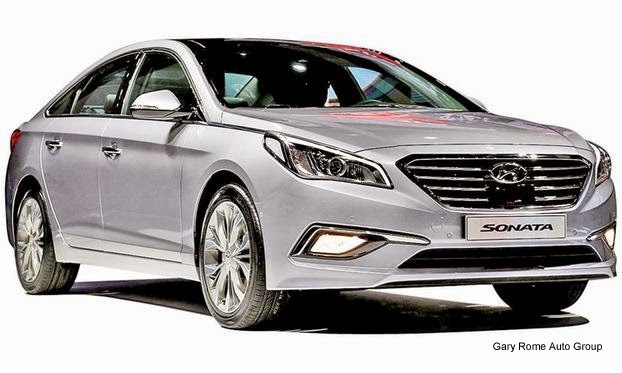 While the entry level front-wheel-drive Sonata is powered by a 2.0 liter engine good for 157 horsepower, the GL, GLS Special and GLS Luxury models all get a 2.4 liter in-line four that produces 178 horsepower. Although performance is respectable, what really stands out is the car’s rigid chassis and superb handling, thanks to development by Lotus for the Genesis that found its way down to this car. The Sonata damps out virtually all road ruckus, wandering is almost nonexistent, steering feels light, well-weighted and precise, and the car takes bends with no drama. Meanwhile, acceleration is smooth and consistent, and the car hauls its 1,450 kilograms of curb weight around like a much lighter automobile. Once you take into the consideration that this car features stability control and front, dual and side curtain air bags to keep you safe, along with fuel consumption of 25 miles per gallon in the city, 37 on the highway and 29 combined to spare your wallet, the Sonata becomes something of a conundrum. I have always been good at arithmetic, but clearly the folks at Hyundai are using a very different system to calculate their prices, because no matter how I look at it, I can’t figure out how they can cram so much style, technology, equipment, luxury and development into this car for that price. Personally, this is a car I would seriously consider, especially once the more powerful 2.0 turbocharged version arrives later this year. Fortunately, they have a beautiful aquamarine color that would look amazing with that sunroof.